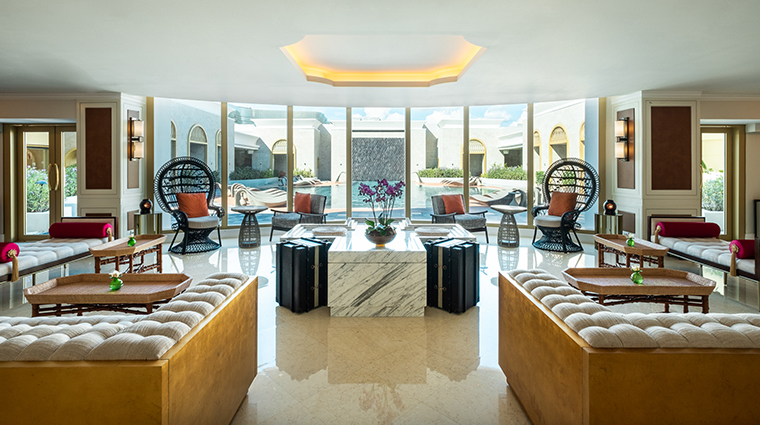 Okada Manila’s The Retreat Spa is the city’s newest — and perhaps grandest — center for relaxation. 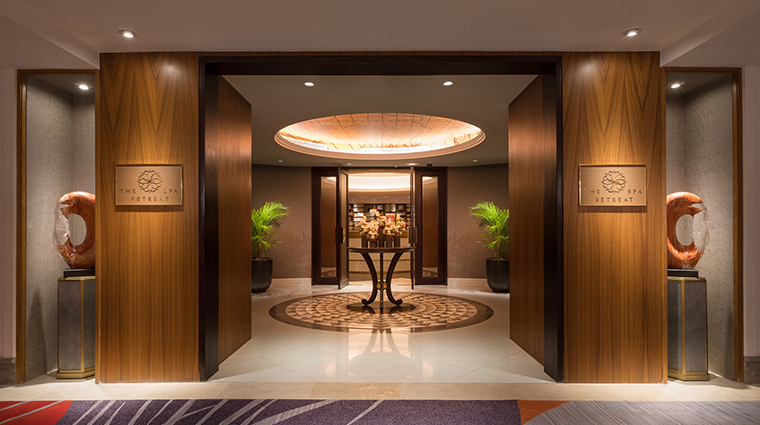 The décor and theme of the spa revolve around travel, as shown in the map mural above the reception desk and the luggage-inspired display case showcasing the products used for treatments and services. The Retreat Spa aims not just to work out your kinks, but to pamper beyond measure. Just think of a bespoke barbershop where you get to enjoy a glass of premium whiskey while getting a haircut or shoe shine, a salon to cater to all your glamorizing needs and a healing, rejuvenating spa. Don’t miss the spa’s unique Wave Dream, a dimly lit room with four reclining lounge chairs where you can lie down, unwind, stare up at the ceiling and watch a pool of water projection. The waves on the ceiling, coupled with the soothing music, help you prepare for the relaxation that awaits, or to ease into the real world after a treatment. The pool at The Retreat Spa, while smaller in size, is beautiful. Just a stone’s throw away from a detox bar, this swimming hole is for adults only, ensuring you’ll have some much-deserved quiet time. The relaxation room at The Spa Retreat offers more than just a place for a quick shower and change or to stow your belongings. You’ll want to linger in the serene facility’s wet steam room, dry sauna and huge hot pool with water jets. Plus, it stocks premium products from all-natural, organic skin care brands like Ila, Eminence, Voya and Ling New York. 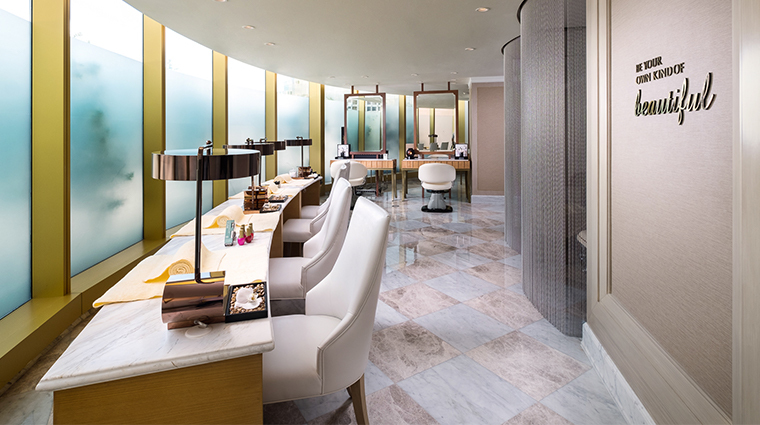 Drop into the exquisite salon for a new haircut, a glam mani-pedi session or makeup. Coming soon to the luxurious facility, The Sole Retreat Foot Spa will provide a haven for those on the go, offering quick foot rubs, head and neck massages, and quiet corners for power naps. Reservations are highly encouraged to make sure that your treatment or service of choice is available. The Spa Retreat is a child-free zone. Leave the young ones to the capable hands of teachers and caretakers at Okada Manila’s kids club, Play, so you can enjoy your me time. The fitness center is open 24/7, so you can grab a workout any time of day. Personal trainers are also available, should you need any assistance. For something out of the ordinary, try the Manila spa's Duyan (the Filipino word for “swing”), a deep-tissue rubdown based on a traditional Filipino massage called hilot that targets specific aches to restore body balance. The most-requested treatment at The Retreat Spa is a signature therapy called Dance of Waves. Personally devised by the in-house spa manager, this unique offering features a flowing forearm massage that glides through the entire length of the body to help you feel calm and relaxed. 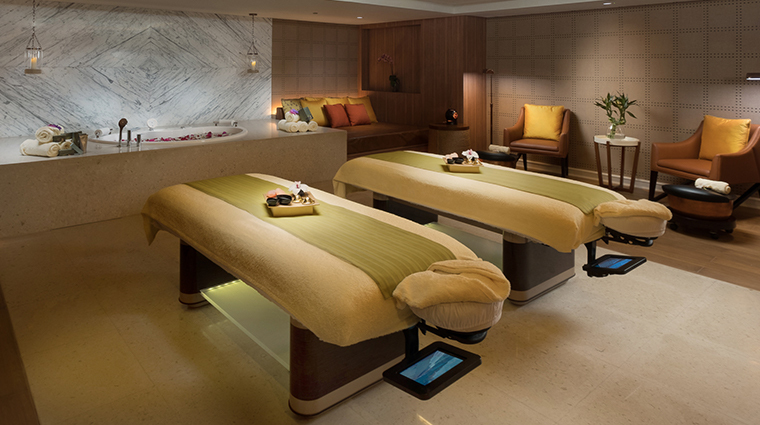 Couples can relax together with one of the His and Her Spa Journey packages. The 120-minute-long Couples Connect package is designed to rekindle romance with a body scrub, a “backcial” (a facial treatment for the back), a soothing massage and facials. Every man deserves to have the barbershop experience at The Retreat Spa at least once in his lifetime. Oozing with sophistication, this gentlemen's-club-inspired space is clad in dark wood and warm lighting, reminiscent of a Prohibition-era speakeasy — except here, you get to sip a glass of premium whiskey while getting your hair cut, your shoes shined, a shave or even a beard-sculpting session. There are 10 well-appointed treatment rooms fitted with high-tech sound and lighting systems to match the mood of your service. By the pool, you can have light meals, healthy snacks and drinks at the Tonic Bar. The carefully curated menu ensures that each meal and beverage is less than 350 calories per serving.